Vintage china cake stand hire for wedding, hen party, big birthday, tea for two and any other party hire. High quality mixed vintage china for hire in Somerset, Dorset, Devon, Cornwall, Bath and Bristol. So if you are looking to impress your guests with a stylish traditional way to serve your high tea. Why not use the traditional English tea party favourite of a vintage cake stand. 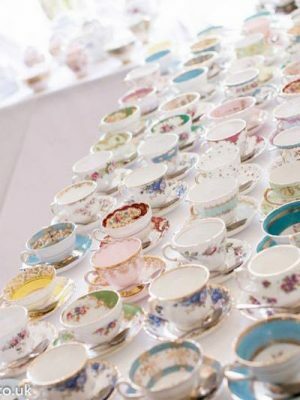 We hire the complete range of vintage china for hire, so you can choose whatever you like. If you need to add cutlery, we have a few ranges that you may like to consider, such as our Perles range. If you would prefer a plainer style, have a look at our Harley range. We also stock a wide selection of glassware, so if you fancy a cocktail, a martini, pimms, have a look! If it’s white linen you desire to cover your vintage tea party tables, then we can also offer that service. Alternatively we can also supply the complete range of tables to display your vintage cake stands. Chivari lime washed chairs, or our wooden folding chairs are also a perfect match for your vintage tea party. The vintage cake stands can be use in two, or as three tiers, which ever takes your fancy. The cake stands can be collected assembled, or flat packed for your convenience. Don’t forget we can also deliver your vintage cake stands throughout the South West.